This is a great mix good enough to be tasted at every hour of the day! And now you have them in all their cuteness with 0 calories! The Starfish (I changed the brand.. 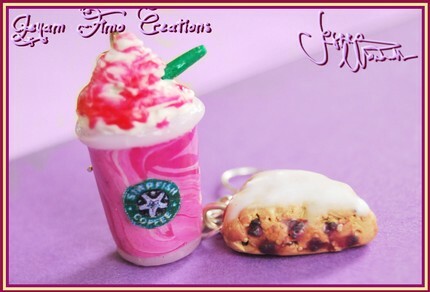 But you know what I mean 😉 ..) Strawberry Cream Frappuccino comes with a realistic whipped cream and strawberry syrup on top. The realistic raspberry scone comes with a realistic texture, raspberry on both sides with syrup and a white icing on top. – The complete earrings are long about 4/5 cm – 1.6/2 in. (from the ear’s hole to the miniature’s bottom). Todays’ St. Patty’s Day Parade starts off with a handmade journal by: Books4Bonkhe which. The store was inspired by Bonkhe Magagula, the 9 year old boy in Swaziland that she sponsors through World Vision. Here’s what books4bonkhe has to say…Since I already enjoy making things, I figure I can do my part to help out by giving a little extra to people who need it. The idea behind it is that I make journals (or other items) that I sell here, and I donate the proceeds to World Vision to help build schools, wells, or just help to improve the overall quality of countries in need. 4x6x1 inch Journal made from recycled box of Bottle Caps (the candy). 20 (40 front and back) cream card stock pages, hand-torn. 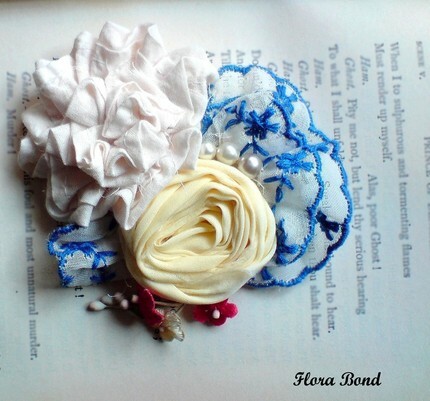 Pages attached by silver curvy ribbon, tied on the inside with a bow. Works great as a quote book, small scrapbook, guestbook, or journal. 100% of sales price goes to Earthquake Relief through World Vision! She is giving away an item of your choice from her Etsy shop! Contest ends on April 6, 2010 and is open internationally. Please email us of you cannot comment below. Thanks and Good Luck! What is Rude & Reckless you ask? It is a one woman run D.I.Y. business with you in mind! For those of you who live by your own laws of outward expression and arent afraid to be yourselves. Most everything I sell is handmade by me out of polymer clay or resin and may vary slightly, meaning: each piece is as unique as each and every one of you! And most importantly, everything is made with love. Myspace users feel free to visit me at http://www.myspace.com/rudeandrecklessclothing. 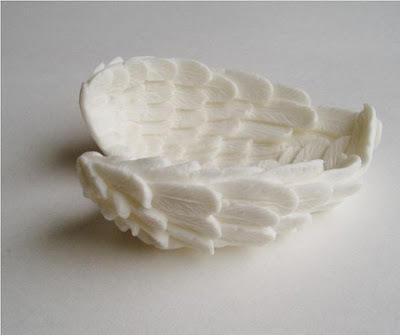 It will feature handmade fantasy art & sculpture! 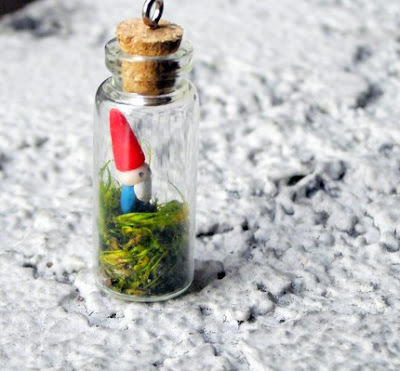 Seh has donated a gnome in a bottle or a PINK skull and crossbones ring to two winners! Contest ends on April 2, 2010 and is open internationally. Please email us of you cannot comment below. Thanks and Good Luck! 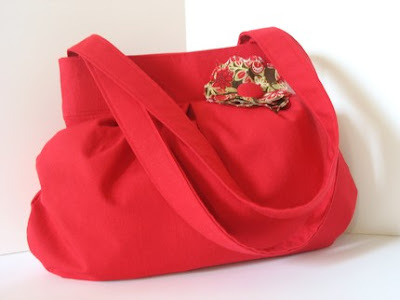 Today’s Etsy shop giveaway is from Em and Sprout! I adore her Mary Janes shoes and handmade tees. Hi! I’m Lindsay. I have two cats named Em and Sprout, they are the loves of my life (besides the hub!) so I decided to name this etsy shop after them. Long story short: I like making stuff. It’s fun and it makes me happy. My current obsession are these fun shoes and I hope you like them as much as I like making them! 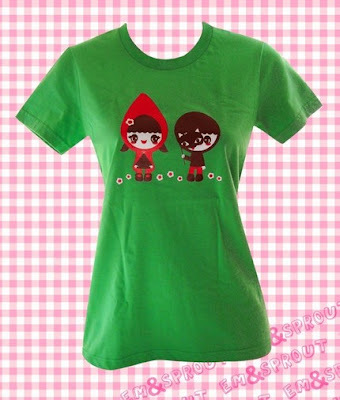 This design of two kids playing dress up was inspired by my love of all things Little Red! It would also make a perfect gift for someone who loves fairy tales 🙂 This ladies cut tee has a sweet woodland feel and is grass green with a brown, red & white screenprint (printed by hand, by me!). Printed on American Apparel ladies t-shirts. Contest ends on April 1st, 2010 and is open internationally. Please email us of you cannot comment below. Thanks and Good Luck! Hi, my name is Pamela Quevedo. I’m a stay at home mom to 2 wonderful little girls. I’ve been creating stuff since I can remember & I’ve never stopped teaching myself new things. While this site focuses mostly on my needle tatting, I’m also known to cross stitch, knit, crochet, sew, bead, play with perler beads, tear apart motherboards for interesting parts & I even draw on occasion. My goal with my tatting is to not only to make it wearable, but interesting & dare I say hip. I’m always interested in feedback on my styles & color choices. 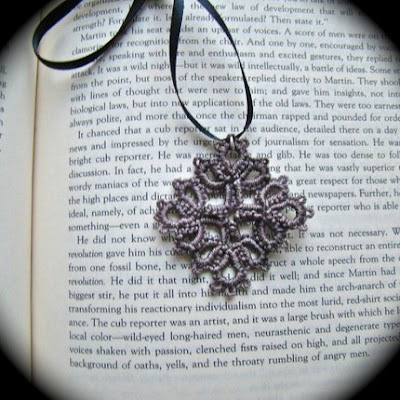 This pendant began as the center of a vintage pattern. Hung by a corner, it reminds me a bit of a Templar cross. Today’s Freebie Friday is from a super colorful and happy Etsy shop. It is summer there now and all year long! Hi and welcome to Lemon Tree Studio! 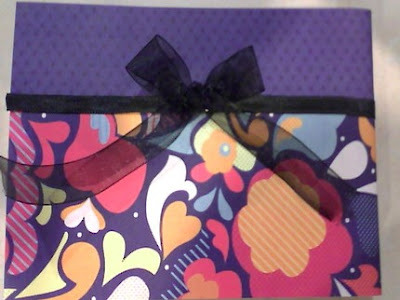 Thanks for stopping by…I’m a stay at home mom with a passion for fabric & paper (and other yummies)! 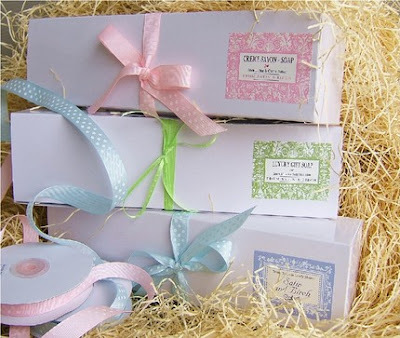 I love scrapbooking, card making, sewing, painting, jewelry making and crocheting. ♥Visit JaneSays.etsy.com for fresh and fun stuff! 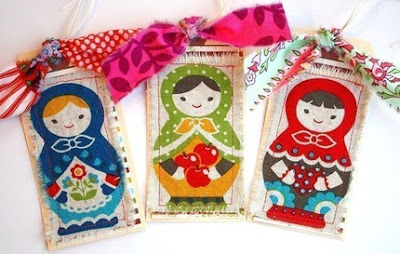 Enter here to win: A Darling set of Russian Nesting Doll tags, made with Japanese import fabric….so cute! 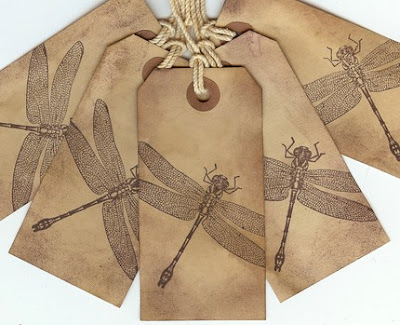 You will receive 3 tags total, each measuring in at 4.75 x 2.5 inches. Simply leave us your name and email address in the comments below! Add your entries up and leave the total in your comment Contest ends March 19th and is open to International Entries. Good Luck!